Professional and hands-on approach with experienced, knowledgeable and passionate teaching. Courses available in Dutch, English, French and German. Evening courses are 6 nights filled with type, ink, paper and presses. Participants will learn basics and are given a group assignment where each member can pursue their own idea or project. Maximum participation 4 members. During the 2-day course, you will get a thorough introduction to letterpress printing. You will learn to set metal and wood type, and print on Vandercook or Korrex proofpresses. € 250, inclusive of materials, coffee and tea etc. Weekend courses can also be private or in groups of up to 4, and can be adjusted to meet the needs and experience levels of the participants. € 450, inclusive of materials, lunches, coffee and tea etc. 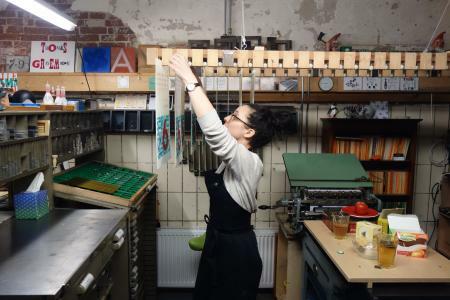 During this 5-day workshop in the studio of LetterpressAmsterdam, you’ll be learning the finer details of typesetting, proofing, lay-out, setting up a forme, preparing for and printing. At the same time, you’ll learn about press maintenance etc. I bring years of experience, you bring enthusiasm, questions and a willingness to learn!